Know what’s worse than green eggs and ham?? 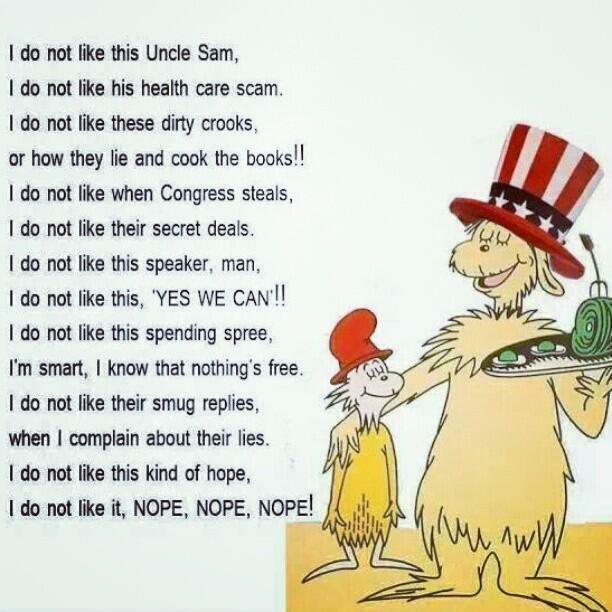 Apparently Uncle Sam and his Healthcare scam! Know what’s worse than green eggs and ham?? Apparently Uncle Sam and his Healthcare scam! Lol!!! This entry was posted in America, Barack Obama, Congress, government corruption, government deception, Government Programs, liberal, Obama, Obama Administration, Obamacare, Obamunism, President Obama, US Constitution, USA and tagged american freedom, barack obama, congress, democrats, Know what's worse than green eggs and ham?? Apparently Uncle Sam and his Healthcare scam!, liberals, obama, obama failed policies, Obama liar, personal liberty, republicans, tyranny. Bookmark the permalink.